About 3 weeks ago my laptop did a BIOS update. Never seen one of those before. Since then the laptop keeps constantly and randomly restarting. I am also receiving error messages that various programs that I am running have been blocked from accessing graphics hardware. Welcome to the HP Forums :) I would like to take a moment and thank you for using this forum, it is a great place to find answers. For you to have the best experience on the HP forum, you could also visit our HP Forums Guide for First Time Here? Learn How to Post and More. I see from your post you are having issues with the notebook randomly restarts after the recent Bios update on your HP Envy x360 notebook. Don't worry we'll work together to help you find a solution. 1. If Windows is open, click Start and then Shutdown. If Windows is not open and the computer has power, press and hold the power button on the computer until the computer shuts off. 2. With the power off, disconnect the power cord from the back of the computer. 3. With the power off and the power cord disconnected, press the power button on the computer for 5 seconds. The power light indicator on or near the power button might turn on briefly but then go out. 4. Reconnect the power cord and turn on the power. Once done, restart the computer and check. To resolve the problem, follow the steps in this section. Errors might occur but not display with Automatic restart enabled. 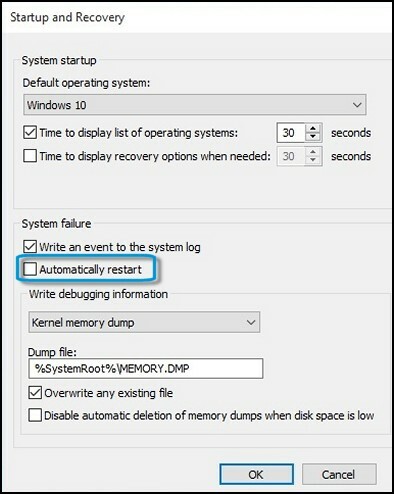 Disable this option to allow the computer to display error messages instead of restarting. In Windows, search for and open View advanced system settings. Click Settings in the Startup and Recovery section. Remove the check mark next to Automatically restart, and then click OK. The computer no longer restarts automatically when a problem occurs. Instead, a blue screen displays with useful information. You can search for a resolution using the information in the error. Thank-you for your response to my problem. I worked through the steps you proposed two days ago and, I regret to say, my laptop became much worse. Now the screen goes blank but the computer does not restart. I am still getting error messages about various programs not being able to access graphics hardware. Just in case I missed any steps in the procedure, I worked through them, methodically, one more time today. What follows is a transcript of the processes, with timings, and what happened. I apologise if reading through this will be tedious for you but I am hoping you might spot a possible solution to my predicament. 13.05 Performed a hard reset, as per your instructions. Then tried opening Microsoft Solitaire. I am not a habitual gamer but use this application from time to time. The games will not load and, after about 30 seconds I receive repeated messages in the notifications, “Application Solitaire.exe has been blocked from accessing Graphics hardware”. When these notifications appear, the laptop stops responding to key presses or Touch Pad movements, the screen goes blank – often with an unusual colour (this one was green with pin-stripes down). Previously the PC would restart itself at this point but now doesn’t, presumably because I have now disabled the “Automatically restart” process, in Startup and Recovery/System failure. 13.16 Powered the PC off, waited 10 seconds and restarted it. I have noticed that the Number Lock function keeps turning off when the laptop restarts (it never did that before). Also Autosave is not working on WORD and EXCEL. 13.26 Using Excel, the PC suddenly stopped responding to key presses. The screen went blank (plain white this time). I powered the PC off and on again, as before. 13.28 Tries opening YouTube, via Microsoft Edge. I make jewellery and glassware as a hobby and like to view video tutorials. The laptop froze again and the screen went blank (grey with pin-stripes). Powered the PC off and on again. 13.30 Tried ‘Restore BIOS defaults’, Accessed Startup Menu and pressed F10 to open BIOS Setup Utility. The Top Menu Bar options are not the same as the ones in the document you sent the link to, so I am a little confused. From the Main page I established that the BIOS Version is F.19 and the BIOS Vendor is AMI. I couldn’t see anything re BIOS Date but there is a Born on Date of 05/29/2018 (if that helps). 13.38 Pressed F9 key, ‘Setup Defaults’ then F10, ‘Save & Exit’. 13.40 Went on to Updating BIOS, using the ‘Update BIOS when Windows is able to start’ option. I immediately ran into problems with Step 1 – ‘Disable BitLocker Drive Encryption’. I typed ‘bitlocker’ into the Search box but could only get a web result. Apparently Drive encryption is not available in Windows 10 Home. I moved on to Step 2 – ‘Get computer product number, ROM Family SSID and current BIOS version’. As I opened up a WORD document, to save some screenshots, Autosave suddenly came back, but keeps failing whilst I have the documents open. 13.58 The cursor suddenly stopped responding and I was forced to use the touch screen facility. Three BIOS updates appeared; F.03 Rev.A, F.17 Rev.A and F.08 RevA. I assumed that these were all older versions of BIOS but I went ahead with downloading them anyway. F.03 Downloaded but I received the message, “This BIOS update is not compatible with this device”. F.17 Downloaded but I received the message, “This is an older version of BIOS which is not compatible with your system configuration”. F.08 Downloaded and I received the message that the Install had completed. The PC restarted, with the cursor now working. 14.07 Tried Solitaire still not able to open games. Still getting the ‘ApplicationSolitaire.exe has been blocked from accessing Graphics hardware’ notification. Tried opening YouTube, via Microsoft Edge; the Notification, ‘Application Microsoft EdgeC has been blocked from accessing Graphics hardware’ appeared repeatedly. When I tried to close Microsoft Edge, the computer froze and the screen went blank (Pale grey). 14.13 Restarted the PC, opened Microsoft Edge and accessed the AAE Glass website/Education Center/Video Tutorials (somewhere I have accessed many times in the past). When I tried to open a video clip I again, repeatedly, received the Notification, ‘Application Microsoft EdgeC has been blocked from accessing Graphics hardware’. This time I managed to close Microsoft Edge without the computer freezing. 14.17 I downloaded Google Chrome, opened it and accessed the AAE Glass website/Education Center/Video Tutorials. I found I could open the video but it would not play on Google, however it would play on Vimeo. I did find that I can play YouTube videos via Google Chrome. 14.30 Whilst attempting to re-add my email account to ‘Mail’ the PC froze and the screen went blank, so I restarted it. 14.33 I tried opening HP Help and Support - the PC froze and the screen went blank, so I restarted it. 14.34 I performed the HP Performance Tune-up Check, selecting the Additional Options of System File Checker, Empty Recycle Bin and Clean Web Browsers. This Tune-up Check completed at 14.52. 14.54 I tried Recovering the last working BIOS version (Step 1) – using keyboard presses. 15.02 Opened YouTube, via Microsoft Edge – got the same notification about Graphics hardware. 15.07 Opened YouTube, via Google Chrome. The PC froze and the screen went blank. 15.08 Restarted PC. Opened YouTube, via Google Chrome and tried to access a jewellery tutorial. The video did, eventually play, but the startup was much slower than I am used to. 15.13 Tried Microsoft Solitaire again; the PC froze and the screen went blank (pinkish red and grey pinstripes). 15.16 I successfully managed to restore my email account, without further issues. I feel the need to explain that I supplement my pension by carrying out exam paper marking during the Summer months. This PC was purchased, just 7 months ago, at great expense, for that very purpose. The BIOS update that was performed, at the recommendation of the HP Support Assistant, has, effectively, rendered my laptop useless and I have no confidence in it. I cannot tell you, currently, if it will run the exam marking software without any issues as I am waiting for the new marking contracts to be issued before I download the revised software. I am now desperate for some help. Just FYI, whilst I was attempting to send the last reply to you, my PC froze and the screen went blank twice so I had to send it to my husband's PC, via email, before sending it to you. After reviewing your post thoroughly, As I understand you have tried to follow the steps suggested and unfortunately nothing has helped to resolve this issue. In this scenario, I would suggest here to run an extensive system diagnostics test as well as an extensive test on the Hard drive from F2(Please remember to capture the failure ID for further assistance). Depending on the test results if the test fails then this is clearly a possible hardware failure with the notebook. If this does not help then the next step would be to perform a recovery using the recovery media, for more details on how to obtain the recovery media, please click here. I will share you a private message with details. Please watch your inbox for more information. don't trust HP Engineer or service person at this time. To manual replace the new graphic driver from AMD is the best solution.